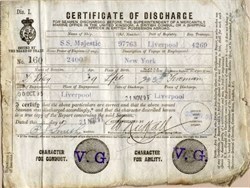 RARE Certificate of Discharge from Ship Britannic hand signed by Titanic Captain Edward John Smith as Master. Date of engagement was 30th JOctober 1895 at Liverpool and Date of Discharge was on the November 21, 1895 at Liverpool and is over 127 years old. Captain Edward John Smith's signature is very desirable and hard to find. 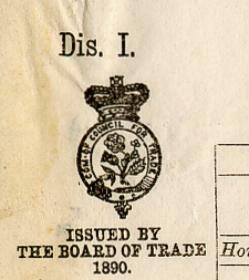 It also contains the water mark which says Marine Department Board of Trade. This is on the serrated edge of the paper where it would have been torn out of its discharge booklet. This edge has slight discoloration. Light folds with wear in corner from probably being stored in pocket. Captain Edward John Smith, RD , RNR (January 27, 1850 � April 15, 1912) was the captain of the RMS Titanic when it sank in 1912. He and his wife Janet had a daughter named Helen Melville Smith. There is a statue to his legacy in Lichfield, England. Edward John Smith was born on January 27, 1850 in the town of Hanley, Stoke-on-Trent. His parents were Edward Smith, a potter, and Catherine Hancock n�e Marsh, who married in 1847 in Wolstanton. His parents later owned a shop. Smith attended the Etruria British School until the age of 13 when he went to Liverpool to begin a seafaring career. He apprenticed with Gibson & Co., Liverpool. On July 12, 1887, Smith married Sarah Eleanor Pennington. Two years later, they had a daughter Helen Melville Smith. The family lived in an imposing red brick, twin-gabled house, named "Woodhead", on Winn Road, Portswood, Southampton. According to his daughter, Captain Smith loved cigars and the smoke from them. He wouldn't let anyone into his study while he was smoking because he didn't want the ring of smoke to be disturbed. Smith joined the White Star Line in March 1880 as the Fourth Officer of the Celtic. He served aboard the company's liners to Australia and to New York, where he quickly rose in stature. In 1887, Smith received his first White Star command, the SS Republic. 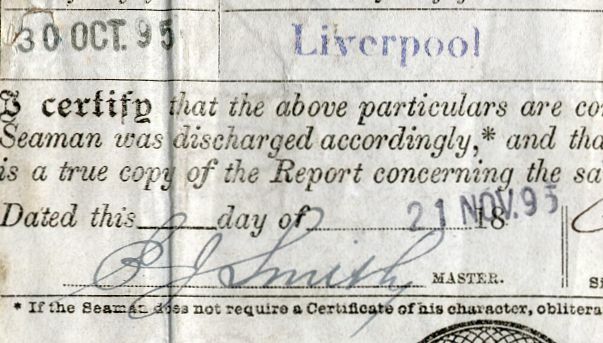 In 1888, Smith earned his Extra Master's Certificate and joined the Royal Naval Reserve (thus enabling him to append his name with "RNR"), qualifying as a full Lieutenant. This meant that in a time of war, Smith and his ship could be called upon to serve by the Royal Navy. Because of his position as a Commander in the Royal Naval Reserve, Smith had the distinction of being able to fly the Blue Duster of the R.N.R. ; most ships flew the Red Duster of the merchant marine. As he rose in seniority, Smith gained a reputation amongst passengers and crew for quiet flamboyance. Eventually Smith became the commodore of White Star Line, or one who all other captains reported to. Some passengers would only sail the Atlantic in a ship commanded by him. He became known as the "Millionaires' Captain" due to the fact that England's upper class were usually the ones who requested he be in command of the ships they sailed on. After he became commodore of the White Star fleet in 1904, it became routine for Smith to command the line's newest ships on their maiden voyages. In 1904, he was given command of the largest ships in the world at the time, White Star's new Baltic. Her maiden voyage from Liverpool to New York, sailing 29 June 1904, went without incident. After three years with the Baltic, Smith was given his second new "Big Ship", the Adriatic. Once again, the maiden voyage went without incident. During his command of the Adriatic, Smith received the Royal Naval Reserve's "Long Service" medal along with a promotion at White Star to Commander. He would now sign his name as "Commander Edward John Smith, R.D., R.N.R. ", with "R.D." meaning "Reserve Decoration." Smith had built a reputation as one of the world's most experienced sea captains, and so was called upon to take first command of the lead ship in a new class of ocean liners, the Olympic � again, the largest vessel in the world at that time. The maiden voyage from Liverpool to New York was successfully concluded on 21 June 1911, but as the ship was docking in New York harbour, it experienced a small incident which would foreshadow future events. Docking at Pier 59 under command of a harbor pilot, the Olympic was being assisted by twelve tugs when one got caught in the backwash of the Olympic's starboard propeller. The tug was spun around, collided with the bigger ship, and for a moment was trapped under the Olympic's stern, finally managing to work free and limp to the docks. On 20 September 1911, Olympic's first major mishap occurred during a collision with a British warship, HMS Hawke, in which the warship lost her prow. Although the collision left two of Olympic's watertight compartments filled and one of her propeller shafts twisted, she was able to limp back to Southampton. At the resultant inquiry, the Royal Navy blamed Olympic for the incident, alleging that her massive size generated a suction that pulled HMS Hawke into her side. At the helm during this incident was Captain Smith. The Hawke incident was a financial disaster for White Star, and the out-of-service time for the big liner made matters worse. Olympic returned to Belfast and, to speed up the repairs, Harland and Wolff was forced to delay Titanic's completion, in order to use her propeller shaft for the Olympic. White Star's most prized captain was yet again at the helm of the greatest steamship when Titanic left Southampton for her maiden voyage. 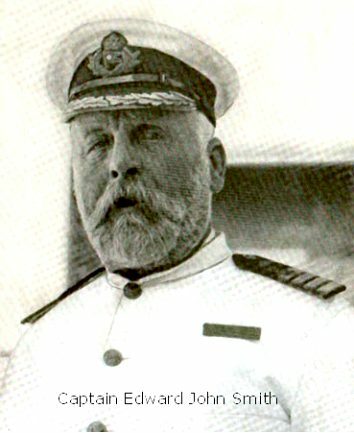 Although some sources state that Smith had decided to retire after commanding the RMS Titanic on its maiden voyage, an article which appeared in the Halifax Morning Chronicle on 9 April 1912 stated that Captain Smith would remain in charge of the Titanic "until the Company (White Star Line) completed a larger and finer steamer". On April 10, 1912, Smith, wearing a bowler hat and a long overcoat, took a taxi from his home to Southampton docks. He came aboard the Titanic at 7AM to prepare for the board of trade muster at 8.00AM. He immediately went to his cabin to get the sailing report from Chief Officer Henry Wilde. After departure at 12:00PM, the huge amount of water displaced by Titanic as she passed caused the laid-up New York to break from her moorings and swing towards the Titanic. Quick action from Smith helped to avert a premature end to the maiden voyage. The unfortunate incident was seen by some as an ill omen and it was reminiscent of the Hawke incident in 1911 when that vessel collided with the Olympic, under the command of Captain Smith. At 11:40PM, on 14 April, the Titanic struck an iceberg in the North Atlantic. The ship sank two hours and forty minutes later killing an estimated 1,500 people. It is still unknown how Captain Smith died. Some say he committed suicide by shooting himself, others say he went down with the ship, and some claim to have seen him in the water cheering the passengers to survive. His body was never recovered. It is not known how Smith died on the night of the sinking. Some survivors reported seeing him in the water with a life jacket, while others reported seeing him in the bridge wheelhouse as the open bridge flooded. In Robert Ballard's book, The Discovery of the Titanic, he claims that Captain Smith went into the bridge to await his fate at 2:13AM, three minutes before the final sinking. This idea is used by the 1997 film. Still, one other passenger claimed to have seen Smith swim back into the A Deck Promenade, soon after which he was sucked back inside the Grand Staircase when the windows gave way. The Titanic struck the iceberg at around 11:40PM, but did not sink until around 2:20AM the following day. This would make Captain Smith's date of death April 15, 1912. Also in question were his last words. Reports include "Be British Boys, Be British! ", "Every Man for Himself!" or, after supposedly delivering a baby to a lifeboat, he refused to be brought aboard, saying "Good-Bye Boys, I'm going to follow the ship!" Bernard Hill as Smith in 1997's Titanic.Smith was first portrayed on film by the German actor Otto Wernicke in the 1943 Nazi propaganda movie Titanic. He was then portrayed by Brian Aherne in the 1953 film of the same name. Following that, he was played several times, including Laurence Naismith (A Night to Remember), Harry Andrews (S.O.S. Titanic) and by George C. Scott in the 1996 mini-series. His most recent portrayal was in 1997's Titanic, played by Bernard Hill who in attire resembled him closely. Captain Smith has also made a cameo appearance in the Star Trek novel series The Captain's Table. In the novel Once Burned, written by Peter David, Smith appears in the Captain's Table - a bar which can appear in any era of history, and which only captains can enter. Smith is seen, clutching a drink and repeating "Damned iceberg. Damned iceberg," over and over, by Captain Mackenzie Calhoun, who takes pity on Smith and gives him his communicator. By the mid-1870s, the White Star Line had grown considerably since the company was first founded 30 years earlier. The company was one of the most popular and respected of all operating on the North Atlantic. In 1871, the first Oceanic had made her maiden voyage from Liverpool to New York and she had soon been followed by three sisters - Atlantic, Baltic and Republic. However, the competition was hard and other companies were soon building ships to match White Star Line's quartet. To keep up with the pace, the company ordered two new ships from the Belfast-shipyard of Harland & Wolff. They were to become the sisters Britannic and Germanic. The Britannic was first intended to have the name Hellenic, but the name was changed before her launch. One can suspect that the two names given were thought to symbolise the friendship between Britain and Germany. The first to be launched was the Britannic, on February 3rd 1874. The two new sisters represented the very latest in ship design, yet they still bore much resemblance to the old sailing vessels. Sir E.J. Harland, the ship's designer, had based the two ships on a barque's design, with four masts of which three were square-rigged. But the Britannic and her sister had many modern features as well. Fitted with eight bulkheads, their iron hulls were divided White Star Line's first Britannic, here depicted with sails set. into nine separate compartments, making them very safe ships. The Britannic was also equipped with an adjustable propeller shaft, so that the propeller could be lowered deeper on the open sea, thereby bettering its thrust. Although not the largest ship in the world, she was still the largest so far built by Harland & Wolff, with a gross tonnage of 5,004. To meet the competition, these two new ships were to be about 1.5 knots faster than White Star's first quartet. A little more than four months after her launch, the Britannic was ready for her maiden voyage. On June 25th 1874, she left Liverpool with New York as destination. However, the adjustable propeller didn't work as planned, and after nine voyages the Britannic was taken in to have it removed. On June 9th 1876, she was returned to service, and the modification of her propulsion system had certainly brought improvements. During that year, she captured the Blue Riband, both westbound and eastbound, by averaging almost 16 knots. The Britannic and her sister continued to serve the White Star Line with a remarkable reliability into the 1880s. But in 1881, the Britannic had her first taste of bad luck when she collided with the sailing vessel Julia near Belfast. Then, in July that year, she went aground while travelling through fog along the Irish coast. This incident caused some damage to the ship's engine room, which sprung a leak. The Britannic was patched up and then towed to Liverpool for repairs. Because of this mishap, the company had to cancel her following voyage. As soon as the repairs had been made, the Britannic returned to service. One and a half years later, the Britannic came to the assistance when her fleetmate Celtic (I) found herself in a predicament in the waters leading to New York. Celtic's propeller shaft had snapped, and she had continued to Liverpool under sail. However, when the two ships met in mid-ocean, the Britannic took the Celtic in tow all the way back to Liverpool. When the Britannic left Liverpool after the 'rescue', a strange sound was discovered. After some investigation it was found that there was a crack in her propeller shaft, and the voyage had to be cancelled. Repairs were made, and the Britannic could set sail again. But her relationship with the Celtic was not over yet. Four years later, in 1887, the Britannic was travelling at some 15 knots through foggy waters 300 miles from New York. Suddenly, her older fleetmate Celtic materialised from the heavy fog. To avoid collision, the officer commanding the Britannic ordered full speed ahead. But it was too late, and the Celtic rammed Britannic at right angles, thereby damaging her at waterline level, just aft of the superstructure. On board the Britannic, three steerage passengers were killed and another two were injured. In these days before wireless no help could be summoned, so the Britannic headed back towards New York, escorted by Celtic. At the following enquiry, both ships were censured for travelling through fog at too great speed. Two years later, the Britannic suffered another accident when she collided with the brig Czarowitz in Liverpool Bay. The The man behind Britannic's barque-like design was Sir E. J. Harland. brig was sliced in half by the Britannic's iron hull. The following year, 1890, became a much happier one for the Britannic. Ever since her maiden voyage, her engines had performed better every year, and this year she made what was to become her fastest crossing ever - 7 days, 6 hours and 55 minutes with an average speed of 16.1 knots. Five years later, when the Britannic had reached 21 years of age, she was taken in for a refit. Her funnels were heightened and she was given two extra lifeboats. Her sister Germanic was refitted with triple-expansion engines at the same time. This could have been done also to the Britannic, but work on the new Georgic was given higher priority. In October 1899, the Britannic was requisitioned by the government to serve as a troopship in the Boer War. With her hull painted white and funnels all buff-coloured, she was turned into His Majesty's Transport No. 62. In this guise, she made ten voyages. In November of 1900, the Britannic was given the honourable task of representing Great Britain at the review in Sydney harbour that marked the inauguration of the Commonwealth of Australia. On that voyage, the Britannic transported the honour guard. However, the trip became a small embarrassment when the ship grounded in the Suez Canal. Yet the voyage could be completed once she had been floated off. Returned to White Star, the Britannic was sent to Belfast in October 1902. There she was to be fitted with triple-expansion engines, like her sister had been seven years earlier. However, the investigations of the ship showed that she was not in a very favourable condition. The Britannic was now rather old, and if she could not be fitted with new engines, she would be a hopelessly out-dated ship. So, it was instead decided to sell her as scrap. In July 1903 she was sold to German scrappers for �11,500. The following month she was towed to Hamburg where she was to spend her dying days. Engines: 2 x 2 cylinder tandem compound engine turning a single propeller.